Il pane basso è una tipologia di pane caratterizzato dall'avere forma piatta, solitamente circolare. Storicamente, gran parte delle culture hanno sviluppato delle ricette di pane basso, alcune molto risalenti nel tempo. Il pane basso può avere uno spessore variabile da pochi millimetri a vari centimetri. La gran parte dei tipi di pane basso sono fatti con farina, acqua e sale, ma in alcuni casi possono esservi ingredienti ulteriori rispetto a quelli base, come il pepe o altre spezie e vari tipi di olio. Una gran parte di pani bassi sono anche azzimi, per quanto alcuni siano leggermente lievitati (come la pizza e la piadina). 2005. "High-Profile Flatbreads - Say Goodbye to Insipid White Bread When Tortillas and Flatbreads Come to Town". FOOD PRODUCT DESIGN -NORTHBROOK-. 15, no. 1: 96-114. ISSN 1065-772X (WC · ACNP). 2008. "Flatbreads Old World: Meets New Flatbreads from All Over the World-Including Tortillas, Arepas and Naan-Are the Newest Hot Ticket in Both Retail and Foodservice Products". FOOD PRODUCT DESIGN -NORTHBROOK-. 18, no. 11: 38-43. 2008. 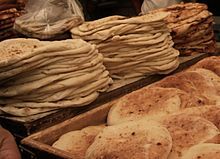 "Storied Breads: With a Continuing Focus on Food Origin, Flatbreads Offer Manufacturers a Way to Tempt Consumers with Authentic Products Celebrating the Oldest-Known Bread Traditions". BAKING AND SNACK. 30, no. 7: 35-42. ISSN 1092-0447 (WC · ACNP). 2010. "Glycaemic Index of Indian Flatbreads (Rotis) Prepared Using Whole Farina di grano and Atta Mix-Added Whole Farina di grano". British Journal of Nutrition. 103, no. 11: 1642-1647. ISSN 0007-1145 (WC · ACNP). 2011. "Flat-Out in Love with Flatbread Here Are 5 Reasons Foodservice Is Smitten with Flatbreads". FOOD MANAGEMENT -NEW YORK THEN CLEVELAND OH-. 46, no. 11: 30-35. ISSN 0091-018X (WC · ACNP). Alford, Jeffrey, and Naomi Duguid. Flatbreads and Flavors: A Baker's Atlas. New York: W. Morrow, 1995. Summary: Recipes for more than sixty varieties of flatbreads along with 150 recipes for traditional accompaniments to the breads, including chutneys, curries, salsas, stews, mezze, smorgasbord, kebabs, etc. Craddock, Anne. Textural Characteristics of Bagels and Ethnic Flatbreads. 1998. Thesis. 124 leaves. German, Donna Rathmell. Flatbreads from Around the World. San Leandro, Calif: Bristol Pub, 1994. Hansen, Eric. 2015. 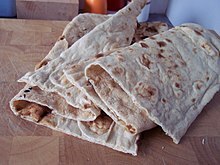 "Fabled Flatbreads of Uzbekistan." Aramco World. July/August 2015. Pages 32–39. Helou, Anissa. Savory Baking from the Mediterraneo: Focaccias, Flatbreads, Rusks, Tarts, and Other Breads. New York: William Morrow, 2007. Kahlon, Talwinder Singh, and Mei-Chen Maggie Chiu. 2014. "Ancient Whole Grain Gluten-Free Flatbreads". Food and Nutrition Sciences. 05, no. 17: 1717-1724. Khawaja K.I., et al. 2012. "Glycaemic, Insulin and Ghrelin Responses to Traditional South Asian Flatbreads in Diabetic and Healthy Subjects". British Journal of Nutrition. 108, no. 10: 1810-1817. Reinhold, John G., Bahram Faraji, Parichehr Abadi, and Faramarz Ismail‐Beigi. 1981. "An Extended Study of the Effect of Iranian Village and Urban Flatbreads on the Mineral Balances of Two Men Before and After Supplementation with Vitamin D†". Ecology of Food and Nutrition. 10, no. 3: 169-177.